Our guides are definitely a favorite among visitors! Not only do they accompany you on your tour to protect your safety, but to guarantee you have a wonderful time. They make the experience fun for everyone. Whether it’s telling jokes and making you feel safe to help you overcome your fears or teaching you more about the area, your adventure is tons of fun with them around. Another thing visitors love about ziplining with us is the opportunity to learn more about Hawaiian history and culture. You will learn about the working farm, the history of the towns on the North Shore, and more. We have educational exhibits set up along the tour that help you see how Hawaii has changed throughout the last few hundred years, from Historic Hawaii, to the Plantation Era, to today. You will even have the chance to taste fresh fruit from Keana Farms! Tasting apple bananas and cherry tomatoes has become a regular part of our tour. Of course one of the main reasons people go ziplining is to take in all of the amazing views, and our zipline tour allows you to do just that. Your adventure begins with a 10-minute, 2-mile ATV ride to the top of the mountain, during which you’ll go by farms, through the jungle, and up the mountainside. The ATV ride gives you the opportunity to take in all the different inland landscapes that Hawaii has to offer. As you zipline, you’ll have constant panoramic views of North Shore’s famous beaches, lush mountains, and farms. The view from high above the ground provides a different and incredible perspective of what makes the North Shore so wonderful. Other parts of the tour that offer gorgeous views include the sky bridges and scenic boardwalks. There’s no better feeling when you zipline in Hawaii than knowing you’re completely safe. Our zipline tour is unmatched in both quality and safety. Not only are our experienced guides there to keep you safe, but we have years of experience building and operating courses around the country. Safety is always our number one priority. We also use a braking system called ZIPKEA to prevent riders from having to hand-brake or drag themselves over spans of cable. You will have a much better time when you’re able to focus on enjoying the experience instead of worrying about safety. 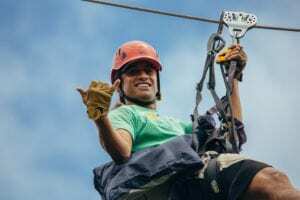 Come zipline in Hawaii with us at CLIMB Works and see for yourself what you’ll love about our course. Book your trip today — we look forward to seeing you soon!